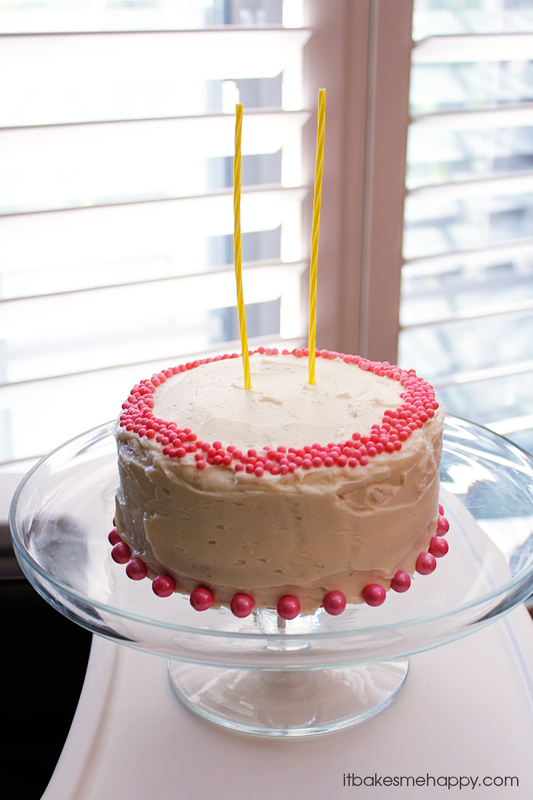 This Vanilla Birthday Cake is a classic vanilla sponge cake with a sweet vanilla buttercream frosting and sprinkles, perfect for any birthday celebration! This past weekend our sweet little girl celebrated her birthday, so of course I wanted to bake her cake! You may remember the super pink party we had last year for her, but since we’re expecting child #2 in the coming weeks I wanted to keep it a little more low key. In all honesty I had a big party all planned out in my head and then I had a reality check which convinced me it just wasn’t necessary. She had a great time unwrapping presents after breakfast and playing with her new toys, we took her shopping and swimming, it was a good day! I decided to opt for a small cake for this years celebration since it was just the three of us and grandma and grandpa that live near by. What this cake lacks in size it makes up for in taste and it was pretty darn easy to bake as well. I love layered cakes, they are so much fun and look more impressive than the amount of work they actually are. A classic vanilla sponge cake with a sweet vanilla buttercream frosting and sprinkles was just what this birthday celebration needed. Whether you just want to bake a cake or need to celebrate someone you love, you should give this cake a try – enjoy and happy baking! Preheat your oven to 350º, butter and flour two 6" cake pans or one large cake pan. In a small mixing bowl sift the flour, salt and baking powder. In the bowl of your stand mixer cream the butter until creamy, add the sugar and beat until fluffy. Add the eggs one at a time, beating between each addition, then add the vanilla. On low speed add the flour mixture and mix to blend. Divide the batter between the two cake pans and bake for 20-25 minutes until golden and the top springs to the touch. Cool in the pan 10 minutes, then invert onto a cooling rack and cool completely. In the bowl of your stand mixer beat the butter until light and fluffy, add the powdered sugar 1 c at a time, alternating with the vanilla and milk until your desired consistency is achieved. I like to beat the frosting 5-10 minutes for a really fluffy texture. top with the second cake layer; spread or pipe the remaining frosting over the entire cake and top with sprinkles and decor. 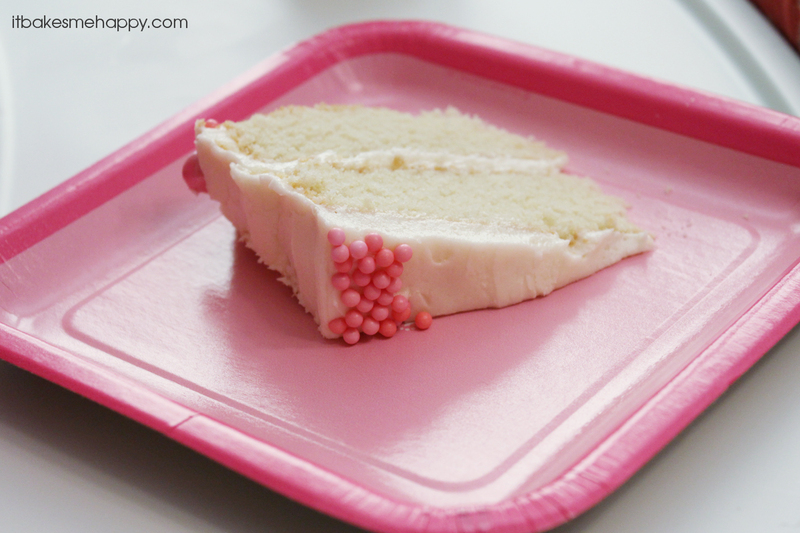 I love vanilla cake and this one is so pretty! Thanks for sharing. I love baking cakes and this is such a beaut! Thanks for sharing and Happy Birthday to your little! This one looks amazing – so simple yet so beautiful. How much would you need to make a two layer with 9 in pans? So pretty! I love finding reasons to make layer cakes, birthdays or not. Thanks for sharing, Emily. Thank you Jelli, I love making them too!